To make crostini, preheat oven to 200°C. Combine oil and garlic in a bowl. Place the baguette slices on a large baking tray. Brush both sides of the baguette slices with the oil mixture. Bake, turning halfway through cooking, for 10 minutes or until crisp and golden. Set aside to cool slightly. Meanwhile, use a peeler to thinly slice the zucchini lengthways. 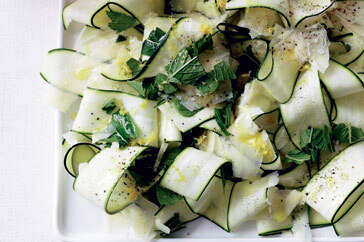 Arrange the zucchini slices on a serving platter. Sprinkle the zucchini with the lemon rind and season with sea salt and pepper. Drizzle over the oil and sprinkle with the mint and pecorino. Serve with the garlic crostini. You can prepare this recipe to the end of step 1 up to 1 day ahead. Store in an airtight container. Continue from step 2 up to 15 minutes ahead.